Today I received the book that I won and you mailed out to me! :) It is even a hardback! I so appreciate your doing all that and I can tell it will be a sweet story..my girls will enjoy it too, so it will be read by many around here. The boys are obviously famous knights of Camelot returning from slaying an evil dragon that was bothering a helpless village? Great shot! They look like they are ready for Halloween! 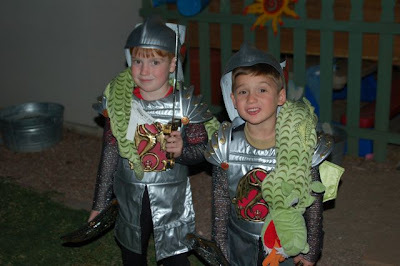 What brave knights they are to have slain a dragon. Is there a tiny damsel in distress lurking somewhere off camera?